Clarence Road comes off Palmerston Street at the traffic lights and heads up the hill beside the canal to Clarence Mill and on into the double cul de sac of Clarence Terrace. The road was purpose built to serve the mill and the two large mill owners’ houses, Rock Bank and Limefield. Rock Bank Rise is a short cul de sac of larger houses built in the early 2000s behind Rock Bank House (picture below) with commanding views over the village. Canalside is the wharf between the mill and the canal. Leads to Rock Bank Rise, Clarence Terrace. Nearest pubs – Holly Bush, Dog & Partridge. There are two notable houses in Clarence Road. 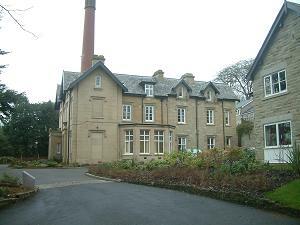 The first is Rock Bank House (below), now converted into apartments and, very regrettably, re-named Carterbench House. The other is Limefield, a big late Georgian house which cannot be seen from any public place. In the wooded area beside the lower part of Clarence Road there is a stone lined channel which appears out of a culvert (locally known as a sough – rhymes with cow) at the top and turns at the bottom to disappear under the road and canal embankment. This is a water course used solely for flushing water from the canal into the river. It is used only when it is necessary to drain the length of canal over the embankment. It is not a canal overflow so don’t be alarmed if it appears to be obstructed, it’s always cleared before use. 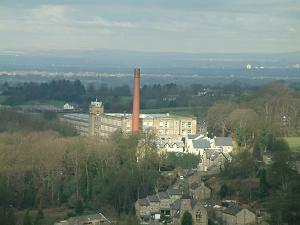 Rock Bank House (left) with Clarence Mill chimney behind. This house was used as a sanatorium during WWI and WWII where many injured servicemen were brought to recover from their wounds. In more modern times (1990s) the building was used for a short time as an office by a toy design company called Carterbench and unfortunately their name stuck during the re-development; it’s properly called Rock Bank house. 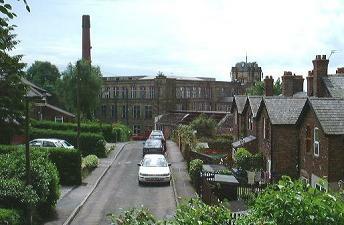 Clarence Terrace (left) is two cul de sacs of brick semi-detached and terraced houses built behind Clarence Mill in the early 20th century for some of those who worked in the mill. No doubt the different sizes of property reflected the status in the cotton mill of those living in them. In past times Clarence Road was known as Clarence Brow and you may still hear this name used by older members of the community. Read about brows on a special page. The new Clarence footbridge 26A across the Macclesfield Canal was built in 2009 at the top of Clarence Road, just before the mill. There are special pages for this. Rock Bank House ; II, Formerly a house occupied by members of the Swindells family, later a war time hospital, then offices (as Carterbench House), now apartments. Built for Martin Swindells I, c1840 (but he died before its completion). Not publicly accessible. Clarence Mill, Clarence Road ; II, Cotton Mill, core built c.1830, extensively extended until 1920. Limefield House ; II, House built c.1830 for Joseph Brooke, one of the developers of Clarence Mill. Not publicly accessible.